Figure 2. Gymnosperm and angiosperm megagametophyte fertilization and the evolutionary history of the angiosperm embryo sac and endosperm. (A) Best hypothesis (Friedman & Ryderson, 2009) for the early evolution of the angiosperm megagametophyte. (B) Megagametophyte structure, fertilization and seed development of gymnosperms and angiosperms. The first angiosperms may have produced four-nucleate, four-celled megagametophytes (one developmental module). Double fertilization of the uninucleate haploid central cell in Nymphaeales and Austrobailyales yields diploid endosperms (Nuphar/Schisandra-type). In the common ancestor of all angiosperms except Amborella, Nymphaeales and Austrobailyales, insertion of a nuclear migration event at the two-nucleate syncytial stage led to initiation of two developmental modules and formation of a seven-celled, eight-nucleate female gametophyte (Polygonum-type). 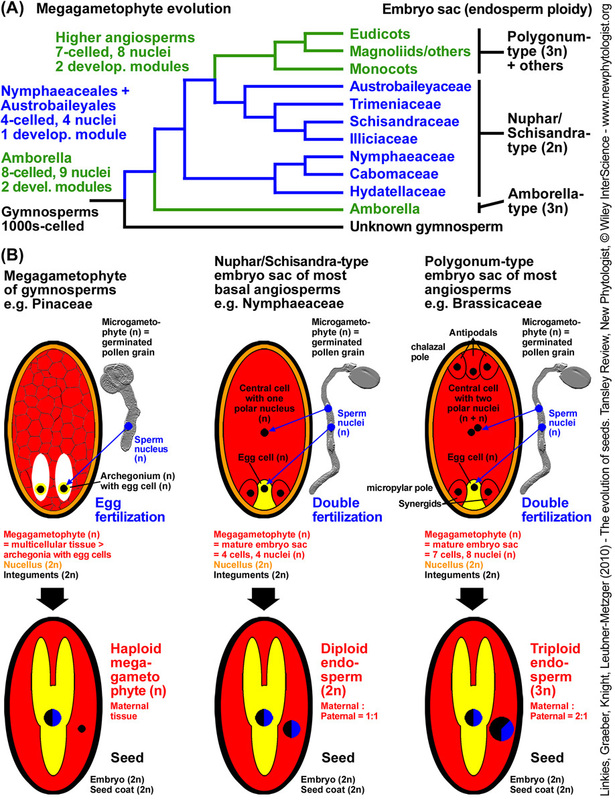 Modular duplication also occured independently in the lineage to the Amborella-type embryo sac; in addition asynchronous cell division in the micropylar module yields a third synergid in the Amborella trichopoda endosperm (Friedman & Ryderson, 2009). In addition to endosperm, perisperm in basal angiosperm seeds is known for Hydataceae, Nymphaeaceae, Cabomaceae and Trimeniaceae.